Richmond City Hall is located at 50 North 5th Street, Richmond, IN 47374; phone: 765-983-7230. 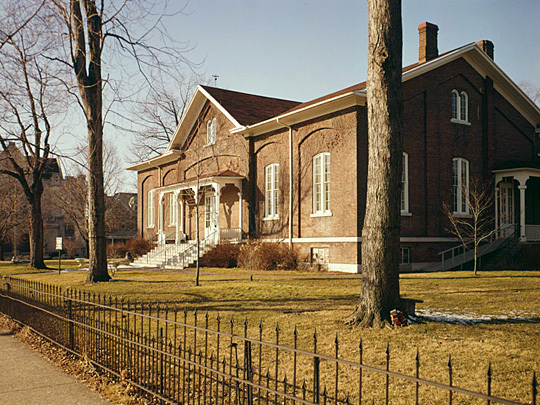 Photo: Hicksite Friends Meetinghouse, 1150 North A Street, Richmond, Wayne, IN, Historic American Buildings Survey [HABS IN-119], Jack Boucher, photographer, 1975, memory.loc.gov, accessed May, 2011. The City of Richmond stands upon an oval crest on the east bank of the Whitewater River, or what is called its East Branch, and the beauty of the location is enhanced by its perfect drainage which tends to the valley and the waters of the Whitewater 100 feet below, thus making it in healthfulness without peer in the State. Richmond is situated about 68 miles nearly due east of Indianapolis and about 74 miles north of Cincinnati. Richmond was the 3rd village platted in Wayne County, Salisbury being the first in 1811, Centerville the second, in 1814, and Richmond in 1816. The county had first been settled around 1806. Much of the ground was owned by John Smith and Jeremiah Cox. Smith proposed to Cox to lay out a town, which, at first was declined by Cox, saying, "I would rather see a buck's tail than a tavern sign." Notwithstanding this refusal, Mr. Smith went ahead and employed David Hoover to lay off a portion of his land for a town, who did so, along what became Front and Pearl streets. Two years later, in 1818, Jeremiah Cox made his addition on the north side of Main Street. Richmond received a borough charter in 1834. John Sailor was elected the first mayor. It was incorporated as a city in 1840, with John Sailor, again, serving as mayor. John Smith opened the first store in 1810. Robert Morrison started another in 1814; one of these 2 formed a partnership under the firm name Smith & Morrison, and a few years later were succeeded by the firm of Smith & Frost. The first brick house was built in Richmond by John Smith, in 1811, and was considered the finest building of the kind in the Indiana Territory. The first tavern was erected in 1816 by Philip Harter. The first log-hewn house erected in Richmond was on Charles W. Starr's farm. The first post office in Richmond was established in 1818 and Robert Morrison was commissioned as Postmaster. The first, regular arrival of mail occurred every 2 weeks; but high water and bad roads made delivery often a monthly accomplishment. History of Wayne County, Indiana, Inter-State Publishing Company, Chicago, 1884.